Controlling the amount of moisture in wood products is a critical concern of the forest industry. An excess of moisture can have a large impact on final product quality and production. With MoistTech’s NIR moisture sensor, wood product manufacturers can adjust moisture levels on real time information lowering raw material and fuel costs, higher yields, and more uniform products. Moisture control will become even more vital as mills begin to expand their production to include niche products and processing requirements become more stringent. With the help of industry partners and 40 years of knowledge, MoistTech offers the most advanced wood moisture sensors for the non-contact measurement of moisture in forest products such as fiber, sawdust, hog fuel, wood flakes, and wood particles. With thousands of installations worldwide in a wide variety of forest products, MoistTech offers both online for the continuous readings of NIR moisture measurement and laboratory NIR moisture sensors for spot tests near lines or in your quality control labs. NIR (Near Infrared) moisture measurement is a non-contact measurement that offers clear advantages over the traditional methods, the most important being ease-of-use, the elimination of hazardous chemicals, and increased efficiency of product testing. With NIR analysis, all manual steps of collecting, drying and accurately weighing samples are eliminated. Real-time data is fed directly to the mills distributed control system for process control. Lumber drying is one of the most expensive and important phases of hardwood processing to help improve lumber quality and lower dryer costs. Incoming wood moisture measurement together with feed rate can prevent overloading the dryer. Mills that use NIR for moisture measurement and control benefit from a reduction in fuel consumption and maximization of energy efficiency by reducing CO2 emissions during drying. Additionally reducing “dusting” that occurs when heat is too high and moisture is too low resulting in product loss. Additionally, measurement of material at the exit ensures that material going to the blender if at the optimum moisture content for resin addition as well as optimizes moisture prior to the palletizer (10-20%). Moisture measurement at the exit of the dryer can save significant amount of fuel while more importantly prevent fires or explosion risk. Trend analysis that is incorporated into each sensor can be used to give operator knowledge of problems before they happen. 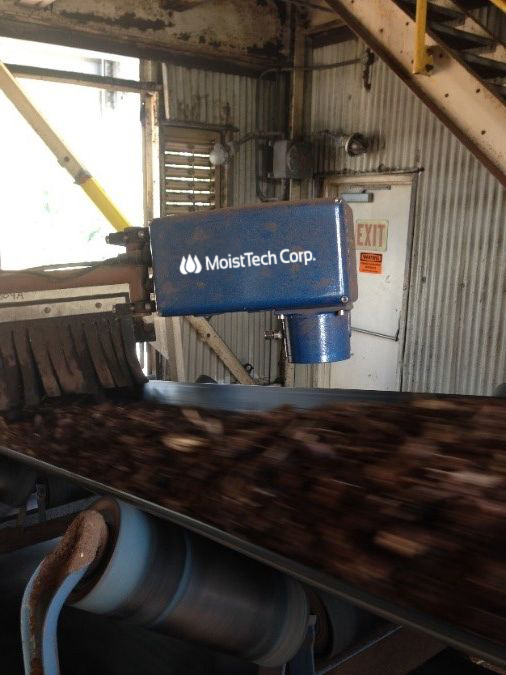 The MoistTech IR-3000 moisture sensor has been used extensively within the wood products industry and is ideal for process control of dryers, blenders and incoming raw material providing real-time moisture measurement. Installation is quick and simple and only needs the wood moisture sensor to be mounted a few inches above the product. MoistTech’s product database allows us to pre-calibrate the wood moisture sensor. With known product moisture samples each instrument can be calibrated within a few minutes prior to shipment. Field installation then becomes even simpler. The IR-3000 stores calibrations that can be transferred to other instruments on similar process applications. Each wood moisture sensor is identical, which then allows calibration settings to be used on all instruments on the same application ranges. Standard power requirements and all outputs are incorporated. The sensor provides extensive data through Ethernet connection or if required has several 4-20 ma outputs together ever other common output. Operator interface and digital displays can also be provided. For additional information or to discuss your application, please contact MoistTech. Product that is put to the blender is critical to the plant operation. Correct wood moisture content will allow for precise blending addition that in turn will reduce waste and provide significant cost savings. Many plants report savings alone pay for the cost of moisture / resin control within weeks of installation. At the exit of the blender the process can be refined to confirm the correct resin addition thus preventing press explosions from high moisture in the forming process. Another important concern of the forest industry is to trying to monitor the quality of raw material going into the mill. Moisture information is needed to determine how much wood a mill is purchasing since much of the pulp wood is purchased on weight. Also, process monitoring is essential due to the variations of quality of the raw wood materials used. An excess of moisture will affect resin coatings causing de-laminating and blown boards. Incoming raw material can be monitored to within 0.5% which allows the dryer personnel to prevent major process changes resulting in interruptions. Dryer in feed can be controlled thus allowing the output to maintain precise moisture levels to within 0.1% accuracy. On hog fuel applications the material can be blended for a more efficient combustion and significant fuel cost. Moisture content of wood affects many wood properties such as strength, drying, glue curing and bond performance. Moisture measurement is an important part of process control during veneer production in order to keep pace with the flow of materials. With MoistTech’s NIR moisture sensors real-time data is fed directly to the mills distributed control system for process control.